Open Start > Settings > Control Panel. Look at the bottom frame labeled Language settings for the system. Click on the Cyrillic box to activate Cyrillic support, then click on the Apply button at the bottom. You may be asked to insert the Windows 2000 CD-ROM. This procedure will copy a number of files to your system, including the file for the standard Windows Russian keyboard layout, kbdru.dll. Double-click on the Keyboard icon. This will take you to the Keyboard Properties window. In the Keyboard Properties window select the Input Locales tab at the top. Click on the Add... button. This will take you to the the Add Input Language window. Click in the Input Language box. Scroll down until you find Russian and select it. Click OK.
You should be back at the Input locales window, and you should see RU Russian added to the list of input languages. A checkmark in front of the EN English keyboard will indicate that the English keyboard is your default keyboard. Leave this as is. Check the Enable indicator on taskbar option located at the bottom left of the window. This will place the language selection option on the bottom right of your screen, near the clock. You can click on the language taskbar to switch typing between English and Russian. Another way to switch between languages is with a hotkey. At the bottom of the Input locales window you see the Hot keys for input locales. Click on the Change Key Sequence... button. Select CTRL, or ALT and a number key to use for switching to English. Click OK. Select CTRL, or ALT and a number key to use for switching to Russian. Click OK.
Click on the Apply button to accept all the changes you have made in the Input Locales window. Open Start > Control Panel (or Start > Settings > Control Panel in classic view). 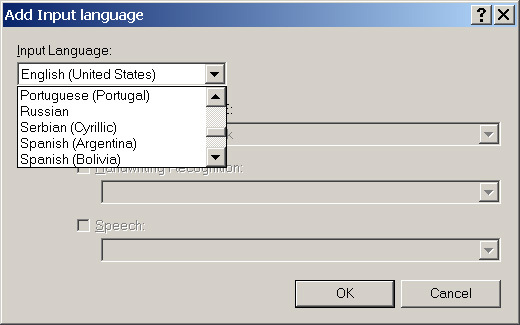 Double-click on Regional and Language Options. 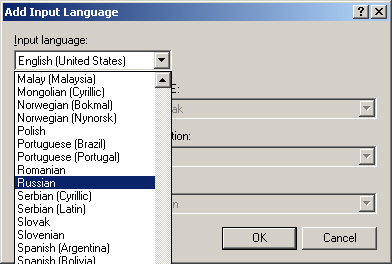 Click on Details under "Text Services and Input Languages". Click Add under "Installed services". Click in the box under "Input language", find Russian in the list and then click OK.
Click on Apply below right and Windows finds and installs the standard Windows Russian keyboard layout file kbdru.dll. In the window under "Installed services" now you should see RU Russian. Click on the Language Bar... button under "Preferences". Select "Show the Language bar on the desktop" and "Show additional Language bar icons in the taskbar". Click OK.
Click on the Key Settings.. to select the key combination for switching between English and Russian. IMPROTANT! 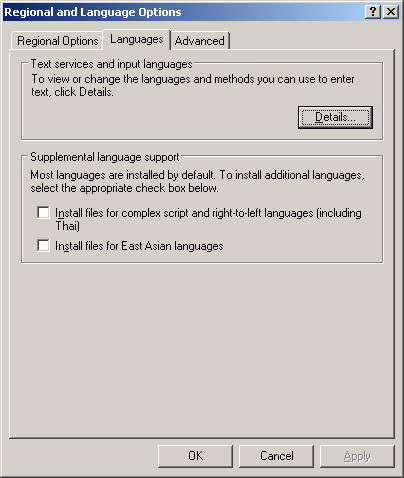 You must activate the standard Windows 2000, or XP keyboard layout BEFORE you can replace it with a phonetic layout. Follow the instructons above for your system. To download the phonetic keyboard layout, click on the KBDRUPH.ZIP link to start downloading a .zip archive. Save the .ZIP file somewhere on your computer. Make sure you remember where you saved it. Unzip the file using WinZip, or any other program for unzipping archives. You should see a folder named KBDRUPH. Open the folder. There are three files in this folder: KBDRUPH.DLL, KBDRUPH.REG, and KBDRU.REG. In Windows 2000 copy the file KBDRUPH.DLL to the System32 subfolder, which is located inside the WINNT folder. In Windows XP copy this file to the System32 subfolder, which is located inside the Windows folder. Check to make sure that the file KBDRUPH.DLL has been copied to the System32 folder. 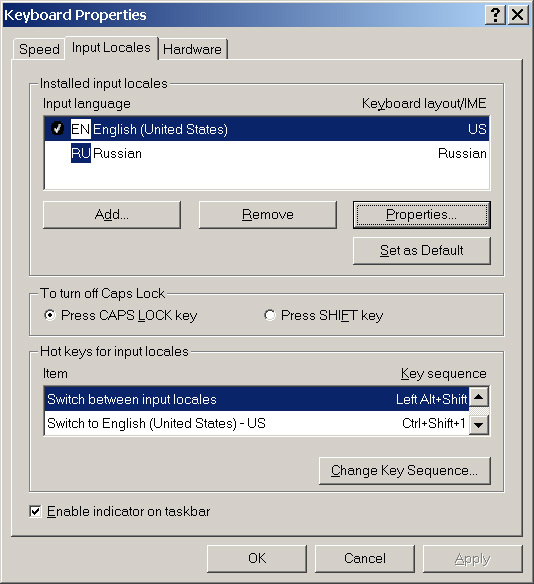 Now you need to to let Windows 2000/XP know to use the phonetic Russian keyboard layout (instead of the standard Windows layout) whenever you switch to Russian as your keyboard. Open the folder where you saved the downloaded keyboard files and double click on the KBDRUPH.REG file. You should get a message that the information has been successfully entered into the Registry. Restart your computer to make the Registry changes take effect. Now you are ready to test your phonetic Russian Keyboard layout. Launch your favorite word processing program. Type few characters in English. Click on the language taskbar at the bottom right of your screen and select RU Russian. Press on several keys on the keyboard. You should see some Russian characters. To check if the phonetic Russian keyboard is the active keyboard (and not the standard Windows Russian keyboard), press on the "P" key. You should see a Russian "�". If what you get is some other Russian character, then most probably there was an error in the installation of the phonetic Russian keyboard layout. Repeat the above steps. If for any reason you want to switch the Russian keyboard layout back to the standard Windows Russian layout, open the folder containing the downloaded keyboard files and double-click on the file KBDRU.REG. In the phonetic Russian keyboard layout the position of most of the Russian letters is on the corresponding transliterated English letters: � is on the P key, � is on R, � is on the G, etc. Until you get used to this keyboard layout, you might want to keep an image of the layout handy either printed out or on your screen. Go to Start > Programs > Accessories > Accessibility > On-Screen Keyboard. An inmage of the keyboard will appear on the screen. 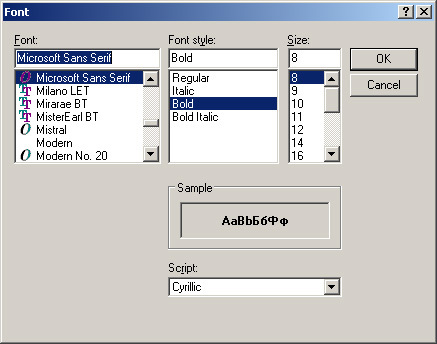 At the bottom of the window under "Script" select Cyrillic. Click OK.
On the Language taskbar at the bottom right of your screen select RU Russian. Now you should see the layout of the phonetic Russian keyboard. If you want the image of the Russian keyboard to stay always on top, click on the "Settings" tab and set the keyboard image to be always on top. If you have difficulty finding the Russian keys on your English keyboard, you can actually click on the Russian letters on the keyboard image on your screen and the letters will be typed in your word processing file, or in a text box on a web page. Before you set up the Input Tablet you will need to install the Russian Homophonic keyboard in Windows 7. 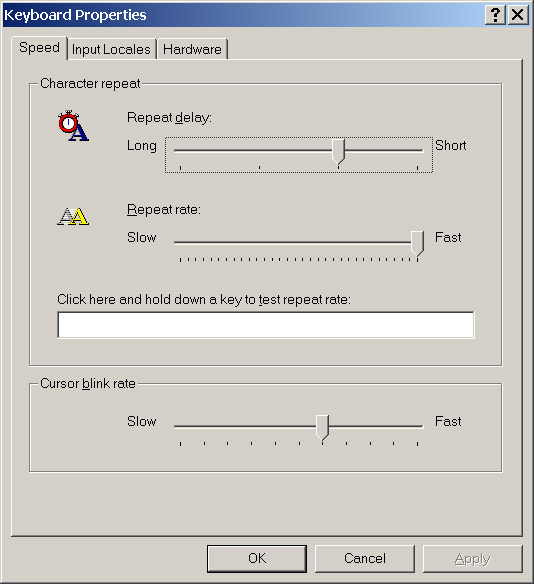 Open tabtip.exe by clicking the Start button. In the search box, type tabtip.exe, and then, in the list of results, look for tabtip.exe. Right-click on the tabtip.exe file. Select Pin to Start Menu or Pin to Taskbar. Access the Tablet PC Input Panel from the Start menu, or the Taskbar. Below is an image of the Input Panel. Click on the Tools button on the top left side to see several options. The English (EN) keyboard layout should be selected automatically. Click on the EN button to switch the keyboard layout between English and Russian.